Since then, I tried to answer most of their questions. This year, I am so swamped with tutoring students, however, that I’m not able to answer all the questions right now. But I have noticed that many cover the same ground—even though the topics range from someone’s world of books, to playing tennis, to making cookies, to an ill family member, etc. So I pulled some of the questions that I thought are more common, along with my answers, in hopes they might answer questions still lingering out there. See below. Most students say they feel stuck. Or they have an idea, but wonder if it’s really a world or if it’s too general or interesting enough for their essay. If that’s one of your concerns, I would suggest reading some of the Q&As below, and see if you find them of help. If you want to read more of these, just go to that Describe the World You Come From Post and scroll to the bottom–at last count there were 228 comments (including my replies). Even if you don’t have a specific question, just skimming through these comments is a great way to search for ideas for your own topics! Also, check out 3 Sample UC Prompt 1 Essays for Describe the World You Come From. And, I have this Brainstorm the World You Come From post and this Show The World You Come From post to help you write your essay in a narrative style. November is a big month for the UC application season, since these are due for undergraduates by the end of this month. You still have plenty of time, but the sooner you get cracking the better! Here are some of the comments/questions from students and my answers. (I put the topic ideas in bold.) Remember, I’m just giving you my best opinion, so trust yourself when deciding what to write about. This is your world and your essay! Me: Your topic idea of writing about your hobby drawing faces is an excellent one, but not necessarily for this prompt. It would be a better choice for a prompt that asks you to describe a hobby, a passion, an accomplishment, that type of thing (more of a personal statement or Prompt #2 for UC app. ).For this prompt, you are looking for a larger “world” or community that influenced you. If you loved drawing faces in a special place, such as an art room at school or a sun porch in your house, you could describe that as your world, and then go on to talking about how this “world” has shaped your love of art, etc. (Other words to think about instead of your “world” could be “community,” “environment,” “space,” or “habitat”–I believe it needs to somehow be a place, either literally or figuratively.) Hope this helps! Aditya: For the “world I come from” prompt, I just don’t understand exactly what it wants me to answer. I come from an Indian Family who doesn’t go to temple much but is deeply connected with my roots. I am very social and active in school, however I feel at peace with all the craziness that goes on in my life when I play Carrom (Indian Board Game) which I learned from my grand father. Could that be a good topic for this prompt? Courtney: For the first prompt, I was thinking of writing about my volunteering at Girl Scouts and at a tennis program. Is that okay for this prompt? Me: Hi Courtney, You can write about volunteering at Girl Scouts (that’s definitely a “world”) but the trick is to focus on something specific that happened, and then describe what you learned from that small experience. Make sure to also talk about how you would use the lessons you learned in your future endeavors. (Remember, this prompt has two parts, and the second asked how your world “shaped your dreams and aspirations.”) Good luck! Amit: Hi, I’d like to ask you your opinion on a couple of the topics I brainstormed. I’m not sure if they fit the categories described under this prompt. My first idea was to write about a social phobia I had and how it was an obstacle in my life and how I overcame it. The problem with it is that I’m not sure if it is categorized under my world. My second idea is about a volunteering experience I had at a food bank I volunteer at. Would this fit the prompt better? Me: I believe a social phobia can definitely be a “world,” in that it can deeply affect your life. I think this could be a powerful topic. My advice would be to think of “a time” when you were dealing with this phobia and describe that first, then go on to explain the phobia and how you have handled it–and most importantly what you learned from dealing with it. Finally, don’t forget at the end to include how it “shaped your dreams and aspirations” for the future. The other topic–volunteering to help the needy–as wonderful as that it, typically leads to a more cliche essay. If nothing else, it’s over-done. Of course, if something life-affecting for you happened during this experience, it could be a great topic. Shreya: Hi janine, I kind of have an idea about what to say for the ”World i come form ” essay, but I’m not a 100% sure how to say it.from a very young age, I have watched my grandmother make these Indian sweets called “gulab jamuns”. The entire process of watching her make them, to eating them is something that is very personal to me and I feel resembles the life I wish to lead in the future. I am a big foodie, but i think this is one memory I would like to focus on- do you think i should go through with it? Me: You totally get it!! Yes, focus on that one memory, and then expand upon what it meant to you, and highlight some values that have shaped you to this day. You could start with a simple anecdote (see my post on How to Write an Anecdote) that would “show” us “a time” your grandmother made these sweets with you. Include what they look like, smell like, feel like, taste like, and how they make you feel–so much wonderful fodder for descriptive writing. (The challenge is condensing that moment into about a paragraph or two at the most. One tip: Start in the middle of the action.) But after the anecdote, then you must explain to us what this interaction meant to you, what you learned from it, and how those lessons “shaped your dreams and aspirations” for the future. Best of luck! Nakul: Hi. I’m really stuck on this prompt and the only thing that i can think of is talking about when my dad bought and uses the computer, he is so dumbstruck my it, that i want to work to better the task of using a computer. Do you think this could for the prompt? Me: Yes, this could be a wonderful topic. Is the “world” you are describing that of technology? If you started with an anecdote or description of “a time” your dad struggled with his computer and how you tried to help him, that could illustrate your main point about the generation gap in your world. Then go on to talk about how you help or deal with your dad, how you feel about the tensions there, and what you learned in dealing with them. And don’t forget to discuss how you will apply those lessons in your future “dreams and aspirations.” Boom. Great essay! Hussam: Hey Janine. I’m finding this essay really difficult to answer. During my brainstorm sessions for a topic I came up with two idea: 1) Dinosaurs and 2) Automobiles. I have a passion for both, and the latter one made me decide to major in Mechanical engineering (not in the automotive specialization anymore though), however, I’m unable to define a particular ‘world’ that made me come to become a dinosaur/car fan. I’ve always loved dinosaurs since I was a kid because of movies like Jurassic Park and The Land Before Time, and well, I would always buy dinosaur toys and half of my book collection is on paleontology and prehistoric animals. How would I be able to define ‘world’ in this context? I know for sure that one of my dreams is to visit as many museums with dinosaur exhibits as possible. As for cars, I became fond of them when I moved to the UAE when I was 10, and it was essentially automotive haven. It was around that time that I also got into racing games and whatnot too, but again the trouble comes in defining ‘world’. One more thing, Hussam. Another way to focus this essay about dinosaurs is to pick one dinosaur that particularly interests you, and again, explore why that is and what it says about you. Then expand the essay to all dinosaurs, etc. It’s important to focus essays, otherwise they get too general and boring. Emily: Wait, I am so confused. Should I be using an anecdote for this topic? I thought an anecdote would be more appropriate for the second essay prompt on the UC application. I’m writing about being a peer educator at Planned Parenthood. Me: An anecdote is just a short description of something that happened, often called a “mini-story.” They are often used at the beginning of essays like these to give the reader an example of your main point, and engage them by putting them right in the moment. 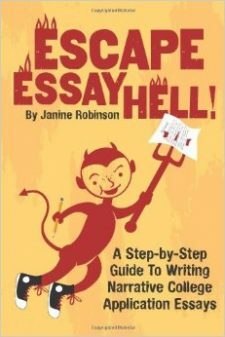 You can use this technique in one or both essays–it’s up to you. I like them because they not only work as strong “hooks” for the reader, but also cast your essay in a narrative (which means story-telling) style and tone. Who doesn’t love a good story? But it’s totally fine to start your essay in another style, if that works better for you. I have posts about how to write anecdotes under the topic listing at the right of this blog, if that helps. Cynthia: Hi Janine, One of my passions is hair dying. I have an unusual hair color that really stands out, and i have had several different colors. Could I write an essay on this and how it has helped me to embrace my uniqueness/creativity? Or does this make me seem superficial? My other idea was to write about my culture, with my parents both being from europe, but i don’t know how to make that a specific “world”. Sandrine: H ello! I find this article to be very helpful; after reading my response to the question, I realized that I was being way too general, so I tried to focus on specific experiences, but couldn’t really find any. I am a reader and a writer, so would talking about a particular world that a book takes place in (for example, the world in S.E. Hinton’s books The Outsiders and That Was Then, This Is Now) and how that has affected me in real life be appropriate for this prompt? Because the books have really impacted me, and even helped me with my depression. Thank you! When I was trying to wrote the “Describe the world you come form prompt” I could not come up with anything specific. Basically I am a kenyan girl,brought up with good circumstances but my parents came from a avery poor background and my relatives are all poor. Whenever i visit my grandparents and my hurt to seem them live in conditions without clean water and beds when my life is so different. I have thing for leadership and I really have the ache to help my family, community and country. I am a normal students who enjoys debate, orchestra.I have also travelled to japan,jordan, the US to represent my school in science fairs and leaderhsip conferences where i had live changing experiences that have ingrained my passion for science and technology. What exactly am I meant to write about?? Hello. I’ve been stuck trying to think of a topic to right about. If I wrote about a day volunteering at a hospital and how that has helped me aspire to be a doctor, would that work for the UC # 1 prompt? for prompt 1, (“Describe the world you come from – for example, your family, community or school – and tell us how your world has shaped your dreams and aspirations.”), is it suitable if i talk about my world in terms of the ‘first airplane ride’ in my life since im applying for aerospace engineering and have a deep passion for aviation? Hi, I was wondering if for the first prompt I could write about when I was once bedridden for about two months and I spent most of my time making small electronics and robotics projects — mostly automating things so that I didn’t have to call my brother for every small thing. I could explain how I fell in love with robotics at that time. Would that be a valid choice? I was thinking of writing about my experience with chronic classical migraines and how they have affected me throughout my life – things like numerous trips to the neurologist and doctor and the frustration of still being left with questions unanswered. I wanted to say how my neurological disorder sparked my interest in neurology and medicine because I was constantly surrounded by medical professions that shared the same curiosity as me in my condition that included a migraine “aura” – strange visual disturbances that precede an attack. Well, it was more like I first felt hopeless, frustrated, and “not normal” because of the migraines’ impact on daily life. But after trips to the doctors, I felt passionately connected to my disorder and learned to embrace it and learn from it by having intellectual conversations with the doctors instead of moping about pain. Which UC prompt & Common App prompt would this go under? And how can I make this topic really have an impact. Hi, for the first prompt can I write about how learning to play golf has taught me to be patient after the constant struggles I have gone through to be decent at the sport. Golf has prepared me to take on a rigorous major like computer science. Hi. I was wondering if writing about a movie theater is acceptable as a “world.” Any advice? Hello, I was wondering for the first prompt if writing about having eczema and multiple allergies since I was 2 and the itchy, uncomfortable world I come from has influenced me to pursue a healthier style of living would be an appropriate topic for the essay? Hi, I haven’t really seen anyone discuss a sport in their essay. I love basketball, but i wasn’t on varsity or anything. I was thinking about writing my essay about how old club coach influenced me by making me “scrappy”(i was a smaller player) and extremely competitive. Would this work? It hasn’t really affected my major choice at all(political science, then law). I was thinking about saying he made me want to be the best, for the “influenced your aspirations” part. Hi, I was thinking about talking about how my bedroom is my world and how it has gave my this passion to want to experience things, like places, people, food, and events. Also, if that doesn’t work, I was going to stick to my bedroom topic, but talk about “Paris on the Wall.” I drew a picture on a scratchboard for my art class(im not artistic though). I chose to draw the Eiffel Tower & ever since then I’ve always wanted to visit Paris. Then it expanded to me wanting to visit other places and experience things. Then I was thinking about going into why California would be good for me to jump start me on my experiencing adventure, since im from Florida. Is this good? P.S. What are some other words I could use besides “things”? Hi, I’m really having difficulty coming up with a topic for this essay. I’ve been more of an introvert for most of my life and the only idea I can think of is the world of my computer and my experiences online. I have used my computer nearly every day since I was in Elementary school, and its really changed my life, for better or worse. I have, for instance, become friends with people from around the world, have been exposed to different idealogies and opinions, and have learned a lot about the world that I tend to hide away from. It’s certainly shaped my sense of morality, my personality, and my perception of my life. I could possibly use this for my second topic, maybe starting from when I got my first computer, as I’ve written a response that my counselor seems to think could fit into this prompt (with modification). I’m just unsure really, and I’ve been unable to write anything since I completed my other essay. Your site has been a phenomenal help throughout my (frantic) journey of college applications, a thank you in advance! Currently my topic is the golf course being “my world”. I read your responses to Nate and TSherpa regarding the “risk of dullness” when writing about sports. I’m just wondering if it’s a good idea to try to incorporate a parallelism between how I learned to deal with problems on the golf course and how that taught me to deal with problems with school, family, & other stresses in the “real world”. Would an extended metaphor/parallelism be too confusing for the reader? Thank you! Hello! These posts have really helped me come up with ideas yet I’m still a bit baffled on whether my topic is appropriate to answer this prompt or prompt 2. Since I was small I’ve lived in places where there were no kids or people of my age that I could interact with so I became a bit isolated. Therefore, I was thinking on writing about the group of people I began to meet from around the world through the internet whom when I’m chatting with them I feel very comfortable with. Could this topic work for prompt 1? Same question as Alexander’s! I am wondering if I can I talk about the internet. The online forums are where I found my passion for technology. Hello- I am having trouble with this first prompt as I want to discuss my dream to be a doctor or a neuroscientist… But the only things that shaped this passion were how I felt when my friend was misdiagnosed as having emotional problems when she really had a spinal tumor and ended up losing her ability to walk after the surgery and my interest with learning about the nervous system in psychology class and how it is so complex. By referring to how I felt when my friend couldn’t walk I wanted to convey that it humbled me that abilities I took for granted such as walking could easily be lost forever due to damaging the nervous system. Would this work? Hi- I am also confused about writing the first prompt- I want to discuss my interest in being a doctor or neuroscientist but the only things that shaped this passion were 1) watching my close friend get misdiagnosed as the doctors said she had emotional problems when she really had a spinal cord tumor; then after surgery she lost her ability to walk. So from supporting her through that experience I first took interest in becoming a doctor out of my frustration that the doctors who treated her did not do everything they could to treat her. But I also was humbled and amazed by the sensitivity of the nervous system and how we could lose everyday abilities such as walking and talking, (which I had taken for granted) by damaging it. And sometimes they can never be recovered. The mystery of how they could not diagnose her also fascinated me as I became more curious about the mysteries of the nervous system. 2)Then I wanted to add how psychology class also furthered my interests in the nervous system. I know I am supposed to only focus on myself- so I was hoping my reaction to what happened to my friend combined with my interest in the nervous system from psychology would be sufficient. Is there a way to make it have more of an impact or to make it more personal? Hi,I’m really stuck on thin topic.I want to write some stuff about my kindergarden imagination which influenced my life a lot. However, how can i possibly connect this with the world? Please help me. I’m writing about defying South Asian cultural stereotypes and competing in a scholarship pageant and my passion for risk-taking and breaking barriers has influenced my passion for neuroscience as a woman wanting to enter a STEM field. Does this follow the prompt? My other essay is more science-focused as it discusses my research. Hello, this website is very helpful to me! Thank you so much for writing it. I’m still in the editing phase of my draft and I was wondering if it would be okay if I wrote about multiple worlds. I feel like I am not defined by only one world so I want to include my family history as well as my world of books to convey my aspiration of travel. (My father and grandfather were war refugees and their experiences have helped me understand the necessity of travel whereas books have helped me understand the wonder of travel.) Do you think this would be acceptable? Thanks a lot! For the UC Prompts, I’m feeling challenged to come up with my essay. My immediate family is small, racial mixed so we don’t follow traditions. My parents are loving and we have family time weekly. I’ve not been through difficult challenges except in my freshman year when a friend turned on me and tried turning my other friends against me. I’ve not really been challenge by fears, or frustrations. Overall, my life is good, I love life, I get good grades, and I volunteer for the community. My family is easy going but vocal, and I’m the introverted one, but I love performing in my dance recitals. Help! Hello! I’m writing about how books inspire me to take chances, be brave, and believe in myself. I described a situation of me reading a book and described how the values that I got from books: be brave and believe in yourself, influenced me to pursue my dream of studying creative writing and literature in college instead of engineering like my parents want me to do. Any pointers on whether this is good? May I please send you my essay for advice? I am planning to write about a visit to my ancestral village and how that whole idea of going there, in the middle of nowhere, multiple times at first seemed pointless to me but I slowly realized what the generations of my family have been through and what are my responsibilities to keep up the family name. These visits and talks to the local people about what happened decades ago and all the way from there till now has really inspired me. Please let me know your thoughts on the same. I would like to thank you for the response. most of my time in high school was spent doing sports specifically football, would it be bad if both essays for UC were focused around my football experience? Hello. I’m writing my prompt#1 on my family’s old apartment back when I was in elemental school and our typical day in that apartment. I described the world using that the name of the street that apartment is on. I’m struggling a little bit with linking that experience to my “dreams and aspirations”. I think having lived the tougher life had allowed me to be appreciative and humble about everything. I’m not sure how to “show” that last sentence and not just “tell it”. Also, computer Science is my intended major, but I’m not sure if saying computer science can help people accurately relate to my experience with being in need of help. Any thoughts or advise would be very helpful. Thank you for your wonderful posts, they are literally the most helpful things I’ve read so far. Hey, I really need your help. For prompt #1 I thought about writing about my trips to our local orphanage. And in my essay the word ‘world’ basically means their community/environment. I wanted to describe that I have hope in humanity after every trip to an orphanage. That I feel that there is a light in the dark. For the first prompt, I don’t know what to write at all, well I do it’s just that I chose to write about my family but can’t seem to find a way to start the essay. My family is a christian Latino family made up of 5. My dad and mom are both in a band and they sing every sunday. I just know that my family has shaped my dreams and aspirations of me wanting to be a midwife nurse ever since the first time I saw my then baby sister in the little hospital crib and because I used to take take of my little siblings when they were barely months old because of my parents being in a christian band. Can you please make some suggestions? We have to write an essay to this prompt for my AP English class and I’m having trouble identifying a “world.” I’ve always been interested in the flow of money and was gunna start with an anecdote about my mom giving me a child’s book on economics when I was 9 and reading it cover to cover that day because I found it so interesting, but i don’t know what the world would be. My mom is an accountant and I look up to her and often went to work and followed in her footsteps, could that be my world? Or my relationship with money such as fundraising, having my own business and having a job at a department store be a world? Thanks for any guidance. Thank you for your response. Do you think this is too risky to talk about? And I guess in short does this anecdote and following analysis answer the prompt and show a “world”? For the UC personal statement prompt #1, I was thinkiing about writing how my kidney problems led me to think about studying pharmacy. How can I convert this to a “world”? I was also considering making the Doctor’s office a “world”, yet I think this seems too illustrate the problems I had that led me to pursue my dreams, not the things I like to do. Is this okay? For the UC personal statement #1, I was thinking about writing how my kidney problems led me to think about becoming a pharmacist. How can I make this a “world”? Also, can I make the “world” my doctor’s office? The things that made me dream seem negative, yet is it okay, although they do not relate to the things I like? Hi! Your feedback is absolutely wonderful and I was wondering if you could give me constructive criticism as well. For the UC #1 prompt, I was wondering if writing about jogging at the Rose Bowl would be a good topic. I’m not really sure if it relates to my future aspiration (which is to become a pediatrician), but what I observed was the determination that every single person that passed by me had: either it was to get into shape or maintain their physical fitness. It’s a bit hard to explain.. but basically, their determination to make it to the end of the track (which is 3 miles!) made me determined to reach my own goal in life. Another topic that I was unsure to write about would be my world at my grandpa’s house. It taught me the typical lessons in life such as how to be patient and respectful, but my grandpa’s house was also a place where multiple special events happened (like where I got my first dog, or where I first saw my baby cousin walk, etc.) Please help and thanks! Hi, I will be applying to UC Berkeley as an electrical engineer. What are your thoughts about centering my world around my parents garage? It is a place where my imagination of building likes to roam free, and has heavily influenced my dreams of becoming an engineer. I also would like to talk about my childhood memories with my dad in the garage, but the UC app says to focus on events within our 4 years of highschool. Just last year, we moved houses, so my garage is now just a memory. Hi! For the describe my world prompt, I have decided to write about being in a dance studio, but I have no idea how to elaborate. Other info: I plan on majoring in biology. Please help! Thank you! I have been racking my brain for something to write about for this topic and I was going to discuss my world of growing up with an extremely powerful business woman mother who started with nothing and the leadership skills and feminist upbringing I’ve had from that. Also discussing her ultimate need to provide for me and my want to provide for her in the future. Would that topic be too general or get the point across well. i am very confused about how to put my essay together i want to talk about how my family is Hispanic and i will be the first to attend college and i want my parents to be proud that i took advantage of this education opportunity. my parent went through so many struggles and when i look back at that i want to mention how i will learn from that and do better to make them proud and be a role model for my younger siblings. i also want to talk about my niece who was diagnosed with a disability an how that made a big impact on my life will i be able to talk about that. what are some idead i can talk about in future? is that where i go back to how i will make my parents proud and do better? Hi,I had an idea about the world I want to describe but I am not sure how to do that exactly. So I chose to describe the time when my uncle went to jail and my aunt and her children were forced to sort of stay at my house for about 1/2 year. I was forced to take many new responsibilities which shaped my character. I have already written my first draft but apparently my teacher believes I am not describing the world. How would I characterize this world? Hi, I was thinking about writing my prompt about the is Boy Scout High Adventure trip where I bike about 200 miles for a week with other scouts and another I just went to, kayaking around Catalina Islands. I was also thinking about writing about my experience in this solar car club last year or about how I always wanted to be in the engineering field when I was little. I don’t know what’s the best for me to choose. Hi, I’m looking to apply to multiple UC schools this coming November. I’m having trouble thinking of a unique idea for this prompt. I eventually want to become an occupational therapist, helping both the elderly and injured/handicapped children overcome their physical and mental disabilities. I come from a family with ALS, breast cancer, prostrate cancer, Autism, and diabetes. I was wondering if writing about visiting my severely autistic younger cousin after school and helping out, learning sign language to try to communicate with her, and observing occupational therapists help my cousin progress would be a good topic? I’m just not sure how I would organize this and start the essay. Hello! For the world prompt, I plan on writing about how avid of a gamer I am. I have a passion for gaming, and I think I will be able to describe gaming “worlds” very easily. However, I really don’t know where to go in terms of defining who I am. I have ideas about saying that I take the time to enjoy myself and relieve stress, or that I learned to cooperate online because of multiplayer gaming, but I’m not really sure where to start, and I feel I need some help in identifying how this affects my life. Also, I’m having problems identifying how this shapes my dreams/aspirations. I plan to be some kind engineer, so I don’t know how gaming can tie to that. I was thinking about writing about my grandma getting diagnosed with brain cancer overcoming it and my role in helping her get through it along with my emotions. would that fit the essay topic? I am writing a rough draft for the UC prompt about describing the world. Do you think if I could write about how I am in a gaming community where I want to be a well-known game for a video game by taking part in tournaments? However, many women such as myself feel insecure about being part of this community because of all the sexism and there were many instances when I ended up backing out. You see, I have always dreamed about becoming a part of the gaming industry in the future, and I thought that becoming involved in this type of thing is what inspired to me think of what kind of future I want. Therefore, I was thinking about developing this essay by saying how the prejudice towards women in the gaming community is what helped shape who I am today: confident, unwavering, and just. In addition, my experience in the gaming community is also what helped shape my goals and why I am dedicated to this hobby. So, what do you think? My description feels a bit bland, but if I were to develop it efficiently, do you think it would be something that colleges look for? Thank you in advance! For this UC prompt, I wanted to write about belonging to two countries. I’m an Indian but I moved to Ghana when I was one. I wanted to start off by recounting an experience with an Indian lady who assumed I could help her wrap her sari because I’m Indian. I had no idea how to (awkward). Then I wanted to move on and talk about how these two countries have influenced me. Is my idea okay? I haven’t seen any sample essays on belonging to a particular country so I’m a bit confused. The only thing I can think of is how my parents have always pressured me to get straight As in high school. They didn’t really encourage me, but expected it from me. However, I wrote a rough draft to this prompt for a class assignment and my teacher said that it didn’t answer the prompt. I really can’t think of anything else. Could you give me advice on how I make it work or do you think I should just write about something else? Hi. I’m thinking of doing my first UC essay on being an atheist in a Christian family and my belief in freedom of expression. I was thinking my specific anecdote would be getting temporarily kicked out of the house for not saying the family dinner prayer.I was going to tie it back to my desire to work in politics as a lobbyist. What do you think about this about approach and do you have any tips? Hello! I was wondering if it would be better if the essay tied in a way to what my intended major is? For example, my major is likely to be Biology but I the topic I’m considering for this 1st UC Prompt doesn’t exactly deal with that. Does that matter? I was thinking about writing either about the local movie theater that I go to. Usually my father and I have a quiet relationship but the only time that we really bond together is through watching movies at the movie theater. Through talking about movies we started to get more comfortable speaking to one another and actually discussing my interest in Biology and he was the one who pushed me to pursue my interest. But i’m not entirely sure it relates to the prompt. i have my personal statement ready and I was wondering if you can take a look at it ? im really getting stuck at what i really want to talk about for my prompt 1 essay. its really annoying and nerve racking becasue i dont know exactly where and how to start writing. some ideas that i have had were 1) my life and asthma 2) being the oldest of seven siblings 3) getting hit by a car while riding my back from rugby practice. i dont know how to be specific with them because they are mostly over a long period of time and not one specific and exact moment. PLEASE HELP ME! and also i forgot to mention is that i have a passion for film and cinematography. should i talk about an experience i had when i filmed something?? Hello im really stuck on this prompt and im really hoping i could get some guidance on it through you. Im not really sure what to write about. The only thing thats really come to mind is my mother. I find it difficult writing about her because i end up writing about her instead of me. I want to write about how shes turned into my world ever since i lost my dad. She pushed my brothers and I a lot and has made things happen for us. I wanted to write about how its made me want to be as hardworking as her and give back in return to her everything shes done for us. I also wanted to add on to it by talking about my fathers brothers. after he passed away they tried to take over my mom by taking everything my dad left behind for us but my mother stood her ground and fought. my only fair is that ill be writing about her instead of me. How can i prevent that. Hi! I want to write about how I struggled to adopt to new environment (Russia). I was bullied for the first few years, but eventually Russia became a part of my world. And now my dream is to connect my country with Russia. Does it fit to the topic? Hi Janine! Right from the beginning, I knew I want to write about my experiences in Leadership as my “world.” Leadership has been so profound and life-changing for me because that was the first time I truly felt like I was in control of my life and who I want to be, and that is so important to me because coming to the US from a country with an entirely different culture has been extremely difficult. Things went all sorts of wrong, from dealing with hostile middle school classmates to getting a knee surgery in my freshman year of high school, which subsequently resulted in missing many weeks of school and slipped grades. In 10th grade, I joined leadership, and I found stability for the first time in five years, which truly turned my life around. My question is, how can I start off my essay? As of now, I’ve started off with an anecdote about the time we and 20 other leadership groups in other high schools came together to raise $12,000 to building wells in Africa, and later on that day, I reflected on just how much leadership has helped me grow and become confident in my ability to make an impact in the world. Is that a good start? And if so, how can I tie that back to how my life was before I joined leadership? Hello, for UC Prompt 1,can I describe a competitive world(study in a prestigious school and my dad lost the job), it shaped my aspiration to equip myself and work hard so as to become a successful person? Do I need to focus on the major I chose in the essay? It seems that being a successful person is too broad. Is it possible for me to write about the gym/weightlifting as my world? I am interested in going into medicine and want to relate how lifting weights allowed me to really feel and appreciate the complexities of my own body (blood rushing through my veins, endorphins being released, etc.) and how this has sparked my interest in studying the human body further to become a doctor. Is this too broad? I don’t feel as if I have any specific experiences at the gym to write about but just lifting weights over the years in general has driven me to want to study to be a doctor. I was brainstorming topics for my world and could fish keeping be a world? Can I talk about being an aquarist? Hi. I am starting on my college essays. And I was thinking about writing when I tried a new food while on vacation and how it taught me to approach things with an open-mind. I was also thinking of writing about my secret activist page that I have on Instagram for lgbtq+ equality and feminism. But I realized that the latter might be too controversial and I’m not sure which one to write about. Any help would be great. Thanks!!! I kind of want to write about both but I don’t know which one would be best to write about. And on the Instagram account that I have, I wanted to do it because I aspire to possibly have someone say that “because of your account, I don’t feel like I’m alone” or something along the lines. I wanted to make a difference in someone’s life. Hi, I’m having difficulty with this essay because I feel like I don’t have “dreams and aspirations.” I’m going into college undecided and I really have no idea what to do with my life because I enjoy all the classes I take at school. I’ve done a lot of activities in the past because I have a lot of different interests, and right now those are piano, horse riding, and running track/xc. I have been given so many opportunities and I’m indecisive, so that really leaves me with a lot of options for the future. I used to live in Japan when I was little where my family and I were introduced to new experiences and food and that is still a part of my life today but I’m not sure if that would be too cliche or boring to incorporate in an essay. I’m also a pretty shy person. If you have any tips for me at all on how to come up with a “world” or “dreams and aspirations” and what direction I should go with that, that would be great. Would talking about being a Big Sister work for this prompt? I have a younger brother and many younger cousins, and I’ve worked/volunteered with children, but I’m not sure if this counts as a world. I want to talk about how being around children influenced my goal of becoming a pediatrician. Does this work? Thanks! Hi. So I am really struggling with writing this essay. I was thinking about writing about how my short height has been an issue that I have had to live with because I get teased so often and excluded from things. However, i feel like that sounds like whining. Then, I thought that maybe I could write about how I love to listen to music and how I love to combine clothes because they are my escape from a lot of the teasing and stress but i’m not sure how I can write about that as a world and also I am not necessarily sure what I want to major in so I do not know how I would connect that to my goals. Any suggestions? I am answering UC Prompt 1 and I wanted input on my topic. I have narrowed by essay topic choice down to two. Either My world of running for sport or my world of being multi cultural. Would a computer program be an okay world, or would the physical place (the space in my house with my computer) be better? I’ve been struggling for a while on deciding what topics to talk about for both the UC prompts. For Prompt 1, I want to describe my experiences at a my local cafe and how I’ve learned important lessons from the people there. Then I want to relate it to my future goals of being a Biomedical Engineer and how I want to incorporate those lessons into achieving my vision. Would that make sense or should I make more of an attempt to write about an experience that relates directly to the biomed world? For Prompt 2, I want to talk about an experience I had where I had to answer a little boy’s questions about why cows are important in the Indian culture and how my involvement in my Sunday school program allowed me to answer that question. Should I be focusing on a topic that relates more to me? For prompt 1, would discussing my poor eyesight and how my world changed with the introduction of glasses be a strong essay topic? I wrote my prompt 1 about playing the marimba, but then realized it was more of a prompt 2 essay. Now I’m stuck on what to write about for prompt 1. I have a couple ideas. One is about how the media and my school have both encouraged me and discouraged me from pursuing physical science. Similarly, I could also write about my family giving me my first telescope and plunging me into my fascination with space. Then, on the total flip side, I could write about how my brother who has Asperger Syndrome made me patient or how my friends influenced me to write my first novel. Should I just write multiple essays and choose one later? Or would one have more impact than the other? Thanks. I was thinking to write about how much my parents sacrificed to raise my siblings and me, and how my struggle to reward them resulted in me becoming a socially awkward geek with little or no confidence. I’ll go through how I decided to change this and worked on improving my persona and confidence. This change also made my grades fall a little lower, but it opened a whole lot of opportunities and doors for me to learn so many new things and shine as a student not just with good academics but also an array of extra curricular activities. I was thinking about topics for UC prompt #1. I thought about my being a part of my school computer club and going for various tech competitions like tech quizzes and debates, implying that I come from a tech related world, despite the fact that any person from my family has been in the field of comp sc. CS is the major I’m applying for, so do you think this would qualify? Or the fact that I live in India, and how multi cultural my environment is. Could my visit to an entrepreneur’s lecture can be a possible world for prompt 1? I feel it impacted my passion for business. I’m having trouble starting my essay, both. but I do have an idea in mind. i am vegetarian is that consisdered a world? please reply. also for the 2nd prompt, about experience I want to talk about an argument me and my little bro had. It’s about an image and he thinks it’s a face and I say it’s a seal, there’s a back story to it about my belief’s. At this point I lost hope. I’m hesitant about my “world” example. I started my essay with dialogue between my friend and me in which she tells me of her depression and her failed attempts of suicide. I then go on to talk about how I failed to help her and was insensitive about it, and how it ended our friendship. now I want to be more aware of the psychology of people and mental illness… I don’t know how this one experience can be considered a “world.” feedback would be appreciated! I’ve been thinking and thinking for months, trying to find some interesting story. The problem is, I don’t really have any. There’s no one particular stories that have made a huge impact on my life. The only thing that pops up in my mind is how diverse my world is. My parents are from different countries. I lived in both rural and downtown areas before. I attend an international school. I became good friends with too many groups where I can’t feel belong to any. Do you have any suggestion for this? I’m writing my UC essay prompt 1.The essay talks about how my brother who was recently diagnosed with Type 1 Diabetes changed our entire family’s life how we stopped doing what we normally do and how it taught each of us new values and new habits which changed us for the better . Is this apt or is it too vague ?